Getting there: From IH-35 in Austin head east on Highway 71. 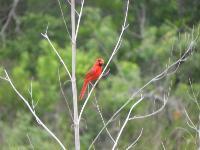 Go past Austin Bergstrom International Airport and look for park on the left in about two of miles. There are signs along Hwy 71. When entering the park following the signs indicating a hiking trail by veering to the right and following the road all the way back to the trailhead. 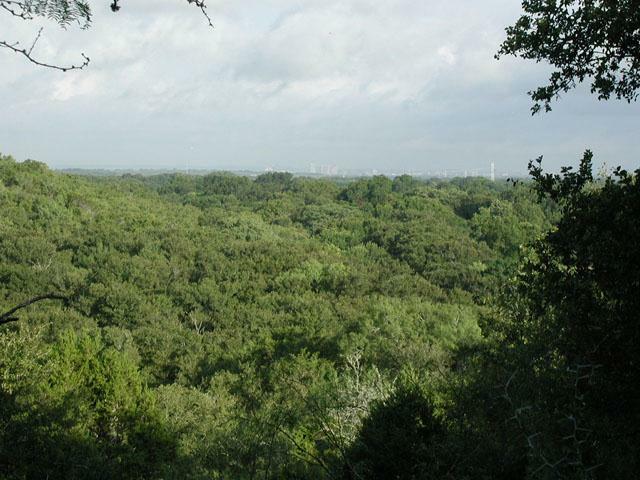 The Hike: Southeast Metro Park is one of the newer parks in the Austin area. Maintained by Travis County it boasts a large number of playing fields soccer and baseball. I had heard good things about the trails here for some time, but when I arrived I wasn't sure how long they were or what type of trail it was. The trailhead has ample parking and a fantastic map of the trails. The trail starts on the topo map at the waypoint "Trailhead". There is ample parking here and a very good map showing the trails and points of interest along them. The trail heads northeast and follows the backbone of a ridge that becomes more pronounced. 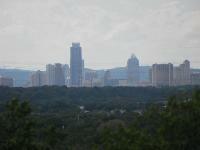 At the waypoint "Overlook" there is a nice sitting area with some unexpected views of downtown Austin. This portion of the park resides on a ridge that overlooks Onion Creek and as it turns out, the center of the city. 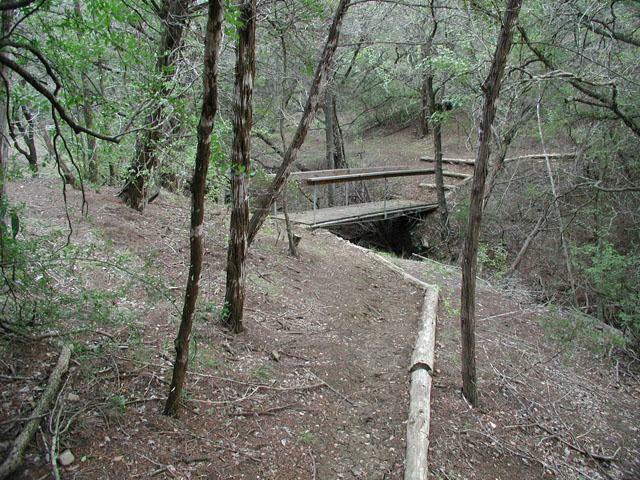 Numerous dry stream bed crossings dot the trail, but they are easily forded because of the bridges like this one. Soon after the overlook the trail forks. I ended up going in a clockwise direction and so turned right. The trail descends into and ascends out of the canyon between two ridges then heads north. The trail surface here is mostly packed dirt with some rock. The trail surface was very well maintained and easy to navigate, even in the steeper sections. The trail descends almost to the level of Onion Creek, though it's never visible. 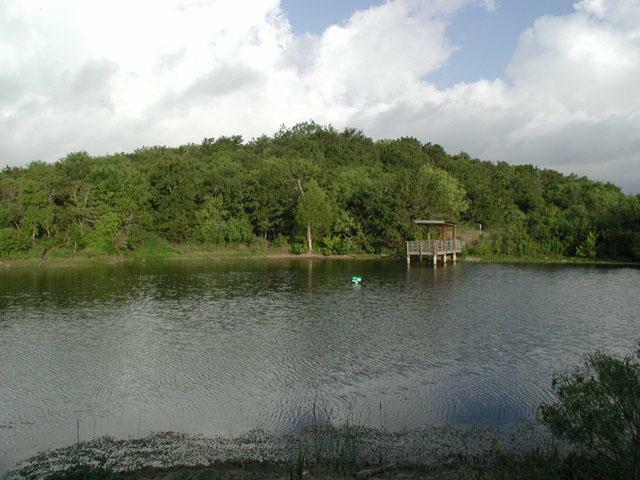 Two ponds dot the path, each with a fishing pier or platform. The second pier is covered and of recent construction. Then it's time to get back up to the ridge top and this involves some of the steeper sections of the hike. A set of log enforced stairs help control erosion of the slopes. 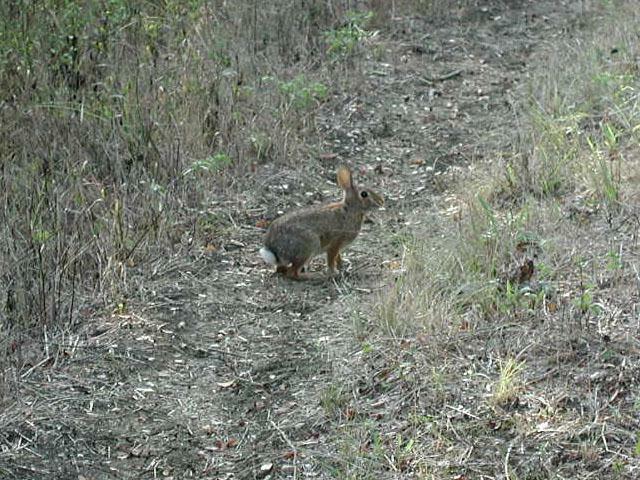 Rabbits, such as this one, were just about the only mammals encountered on the trail. And there were lots of them. Once on top of the ridge, I came to a side trail that was reported to have led to a primitive camping area. That side trail is represented by the blue track on the topo map leading to the waypoint "Camping Area". My comments about the fantastic nature of the trail maintenance does not apply to this side trail. 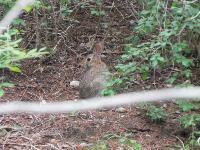 It was severely overgrown and seemed to peter out completely without an obvious end to the trail. I spent a bit of time deburring myself when I got back to the main trail. A view along the trail, facing towards downtown Austin in the distance. Visibility was not ideal on this particular day. Back on the main trail, the path leads south and at the waypoint "View" there is yet another glimpse of downtown. This may be the better of the two views highlighted in the hike, but it's farther away from the trailhead and so does not have as nice a viewing platform. The trail descends a bit, but then follows the contour of the slope for much of the way back to the fork near the view overlook. From there it's a quick walk back to the trailhead. 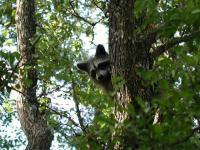 A daytime sighting of a racoon along the trail was an unexpected treat. Encountering a confused raccoon along the trail in broad daylight was a surprise. He ended up deciding that the tree he was in was not high enough for his taste and he bounded to the ground and into the brush away from the trail as quickly as possible. What they lacked in antics, the rabbits made up for in numbers. 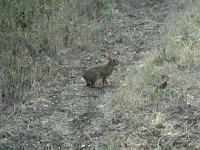 I think I must have spotted close to 10-12 rabbits on this hike, more than I can recall seeing on any other. Several small lakes lie within the park and the nature trail hits each. This one includes a covered fishing pier. The main trail loop (minus the camping side trail) is a bit over 2 miles. But there's a bit more to explore. Just a short distance from the trailhead another side trail juts to the west that the park refers to as the Wildlife Trail. This one leads to the waypoint "Blind" on the topo map. 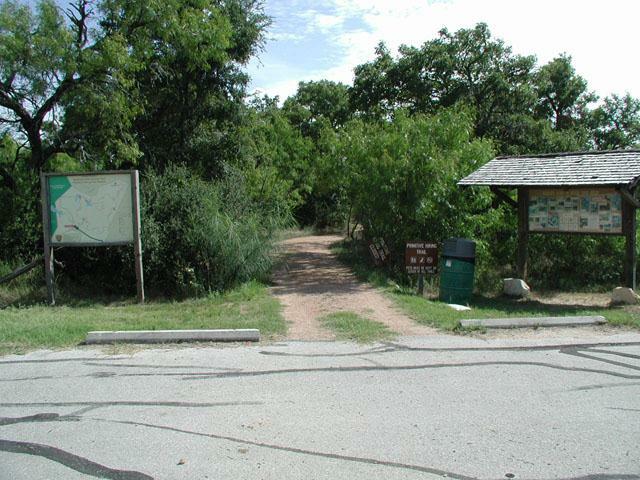 The Wildlife Trail is not as well maintained as the main trail, but it is nevertheless in better shape than the camping area spur. It descends down the ridge, again almost to Onion Creek level, to a small pond. A blind sits on the edge of the water giving wildlife observers an opportunity to see and not disturb some of the birds that frequent the area. On this particular day there was not much to see. 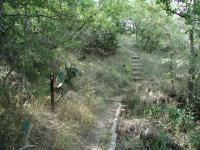 The side trails off of the main loop are more overgrown, such as the Wildlife Trail shown here. One final "trail" is the service road that runs from the trailhead and arcs its way to the two ponds found along the main loop. This is a wide, rocky jeep trail that is not without its own merits, though the lack of shade on a sunny day made the going a bit rough as the temperatures rose. In all I was able to squeeze out about 4.75 miles along the trails. The official tally for the park is five miles, two of which is a concrete loop not documented in this writeup and three for the nature trails. In three hours of hiking I only saw two people on the trail, and they were park workers on a cart near the trailhead. 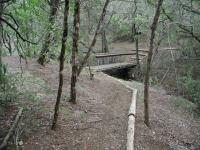 This trail is one of the best, if not the best, hike in eastern Travis County. It's got a couple of decent views, well maintained trails, descent terrain and solitude. I know that I'll be back. Overlook and ponds--improved trail needs more trees! We hiked the primitive trail loop and then, to pad out our steps, took the unprimitive sidewalk around the playing fields to a jeep track to the shoulder of 71, then back to the trailhead. 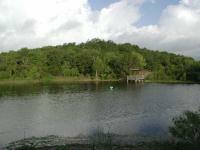 The good: the primitive trail is nice and shady and includes a scenic overlook and couple of ponds. There are flush toilets and picnic tables near the trailhead. The meh: It's pretty-ish, but it's no Wild Basin or Turkey Creek. Lots of mesquite. The primitive trail (the only part that feels like "hiking") is a little short, and much of the paved/graveled non-primitive path is hideously treeless and exposed. And we accidentally wandered onto private property and had to take the 71 shoulder to get back to the park, which was no kind of fun at all. The uncategorizable: the battered and dessicated corpse of a mid-size mammal lay in the middle of our path. We couldn't tell what it was--young coyote? Juvenile hog? It was certainly interesting, but, lordy, it did not smell good. Southeast Metropolitan Park is a large municipal park that has numerous amenities, including athletic fields, play areas for kids, picnic spots, a paved walking/jogging path, and a network of dirt trails for hiking. I went to Southeast Metropolitan Park primarily for the hiking trails, but also walked the rest of the park for additional mileage. Glad I reread this before we went. They oiled the driveway and it was closed, but knew there was a concrete trail. we went to the right and it counted down instead of up, and actually got lost once. It is nice but once in 4 years is enough for us. If you're out this way McKinney Roughs is nicer, longer, and worth the extra drive. Some idiots playing soccer had their radio so loud we could here it all the way up a good chunk of the path. I was very impressed by this trail except for one thing... the cobwebs. Holy crap. I have to say, I am not a squeamish gal. 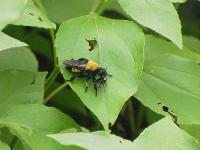 I don't mind bugs, spiders, snakes, mud, etc. And I LOVE hiking and backpacking with my dogs so I'm willing to put up with a lot. But I am not exaggerating when I say I was hit in the face with cobwebs every 15 seconds or so. And not just a string of cobweb, a full-on spider web. It was almost comical, but I got to the point where I just wanted it to be over... and that's sad to say about any hike. I found a 3-foot branch shaped like a leaf rake and swung it in front of me the whole time to clear the way. It actually had me thinking twice about coming back. As you enter the park, bear to the left to get to the trail head. You have to drive all the way to the back of the park and there is a small parking lot here for trail use. Also be sure to check out the fruit and nut trees on the left right after the entrance to the park that the city has planted. There is a descriptive poster and each individual tree is labeled.